As a driver, you need to be prepared for anything when navigating the roads. Having your tyre burst is one such thing. You may not want to think about it but you do need to know how to handle it should you find yourself stranded on the side of the road. Experiencing a tyre burst could lead to you losing complete control of your car, resulting a potentially fatal accident. You may consider yourself a safe driver and your car a safe traveling tool, however anything can happen and a tyre burst is one extremely dangerous situation you want to try and avoid or deal with as best possible. Prevention is certainly better than cure when it comes to road safety. double check for any damage or foreign objects on your tyres. 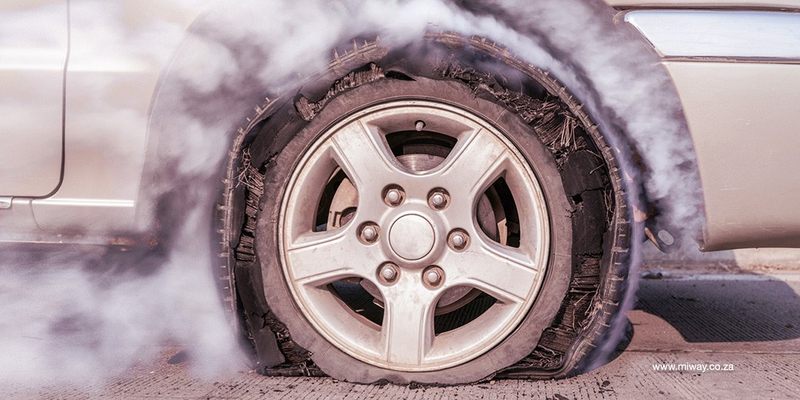 One of the most prolific reasons for a tyre burst is that of ‘wear and tear’. There is no escaping the fact that, at some point or another, you will need to replace your tyres. When it comes to a tyre burst, it is almost impossible to predict how your vehicle will react, even if you’ve tried to prepare for it. Should you find yourself in a bursting emergency situation, it is essential to ensure that you remain calm. Put your hazard lights on – your vehicle coming to a sudden stop is a hazard for other road users. Switching on your hazard lights in times of trouble will alert other drivers that they need to be extra alert. Stay hands on – keep both your hands on the steering wheel to maintain as much control of your car as possible. Do your best to keep your car straight and steady. Ease up on the speed – the most common reaction would be to slam on the breaks, however this could lead to your car rolling or tumbling in the event of a tyre burst. Instead, gradually decrease the pressure on the accelerator , let your vehicle come to a halt and remains steady without the breaks. Stay safe and don’t try driving – once your car has come to a complete stop, keep your hazards on and place your emergency triangle where other road users will see it. Don’t try pulling over on the side of the road or driving to the nearest garage as this may cause further damage to your car. Get your car sorted – when your car has safely stopped and you’ve put up your safety alerts, you can then safely get your car sorted out. You can either do a quick DIY and change the tyre yourself with your emergency kit or call on your insurer for roadside assistance. Whatever you decide, always remain alert and consider your safety. Having a car means added convenience to your day, however anything can happen on the road to threaten that convenience. Car insurance can help you maintain your position of convenience in times of unfortunate incidents. Get in touch with MiWay and find out how you can enjoy #insurancefreedom by getting an obligation-free online quote today!